As strategic lead for the new product development process, created linkage between pipeline of new products in development and company strategic goals and objectives, oversaw the consumer feedback process that drove product development and provided guidance as to each new product's most compelling consumer benefits to aid in launch success. The Prime Rib & Peppercorn Sub set a Quiznos record for incremental sales and transactions. 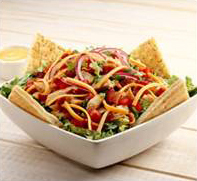 Flatbread Chopped Salads (shown below) significantly enhanced female relevance and became the highest selling non-sub promotion in history. The "Real Deal Menu" of six value priced subs led to record sales and transactions for a new product line and greatly improved value-for-the-money consumer scores.